Hello and welcome to the first post of my blog. I’m sure much of what I will end up writing on here has been said by others, in better ways, and at better times, however this is my place to think with my fingers and to publicly air the thoughts and ideas that trouble, inspire or otherwise haunt me. I hope you will enjoy what you read here, and that it will make you think about things in different ways. I would like to start with something that burns me up from the inside out, that makes me blindingly furious. This may initially seem irrational and absurd, but hopefully by the end of reading this you will agree with my point of view. It is something so simple, so commonplace, that you see it every day and don’t give it a second thought. Probably not even a first. I imagine many of you buy it regularly. It seems healthy, purified, filtered and full of ancient volcanic mineral goodness. So fundamental to life that we take it for granted. Bottled water. Water is fundamentally essential to human life. We need it to sustain our existence. We also use it for cleaning and washing, for sanitation, to irrigate crops, sustain livestock, clean our streets and buildings, in industrial processes and for a multitude of other uses. Its importance in modern society has been key to the development and location of civilizations throughout human history. It’s no coincidence that the birthplace of modern man was on the banks of the Euphrates river. It is so important to us that many world religions ascribe it special spiritual weight and symbolism, such as baptism in Christianity, bathing in the Ganges in Hinduism and ritual cleansing in Islam. So essential is water that it is considered a minimum requirement for habitation; and all modern villages, towns, cities and houses have a cheap, seemingly endless, supply. Those of us fortunate enough to live in rich, industrial countries in he global north have long since forgotten any times where clean water was not in plentiful supply. So much so that we take it completely for granted and rarely, if ever, give it any considered thought as to where it comes from or how it arrives out of our taps. Over one billion people in the world do not have this luxury, and their lives are blighted by this horror. Not only blighted but cruelly and unnecessarily ended as a result of it. 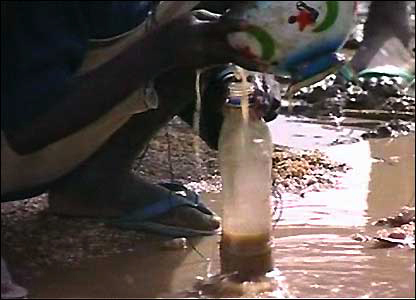 A lack of clean water an sanitation kills 3,600,000 people per year. Lack of clean water kills more children than AIDS, Malaria and Measles combined, yet receives only a fraction of the funding. Despite the extraordinary privilege of having a cheap, clean and plentiful supply of water, for some reason we are not satisfied. We have been blindingly convinced that water needs to be filtered for 3,000 years through ancient volcanic rock. That water somehow gains some magic goodness from faraway places, bubbling up through ancient natural springs. And thus, armed with our superior knowledge that superior water exists, we demand it. We want exotic water. We want magical, exotic water, to the tune of $60,938,000,000 per year. This sum is sufficient to supply hundreds of millions of people with clean water, who desperately need it. Not only that, but the water we demand must be produced in a far away place. It must be bottled in non-biodegradable bottles, made in factories that burn out millions of tons of harmful gases, through a process that wastes even more water. Then they must be flown, shipped or driven thousands of miles around the world to a shop near you. Bottled water contributed about 300X more harmful gases into the environment that tap water. Then you buy it, for around a 1,000% mark up on the price of that water that comes out of your tap. You spend a couple of minutes drinking it. The dump the bottle. This bottle then ends up in a number of places. A landfill, where it remains for centuries, or worse into the sea. Even if you dump it in a bin it then gets transported to a country like India where it is dumped into a human recycling factory, to be sorted by desperately poor people who sort and sleep amongst your rubbish. And all of this process is totally unnecessary! There is no reason for any of it. Water in essence is H2O, it is all the same. The mineral content of water is almost identical wherever you are, and as long as you eat a relatively health diet you receive significantly more of any goodness that might come from a bottle of water. It doesn’t even taste better – that’s all in your mind! The taste experts at the wine magazine Decanter tasted many of the different bottled waters, alongside tap water in 2007. The found, shock horror, that Thames Water, available from taps all over London, came equal third. However the caveat of this study was that they all pretty much tasted the same. It is just water after all. So please… stop it. It is unnecessary. It is harmful. It is a plague on your cognition, your wallet and on humanity in general. Please spend your money wisely, drink healthy, tasty water from your tap, and donate to an organisation trying to bring water and sanitation to those most in need. This entry was posted on 01/05/2012 by Tim in Global Health and tagged health, plastic, sanitation, water.